SCVHistory.com DB6301b | Sand Canyon | Antelope Valley Freeway Opening (First Section), 1963. 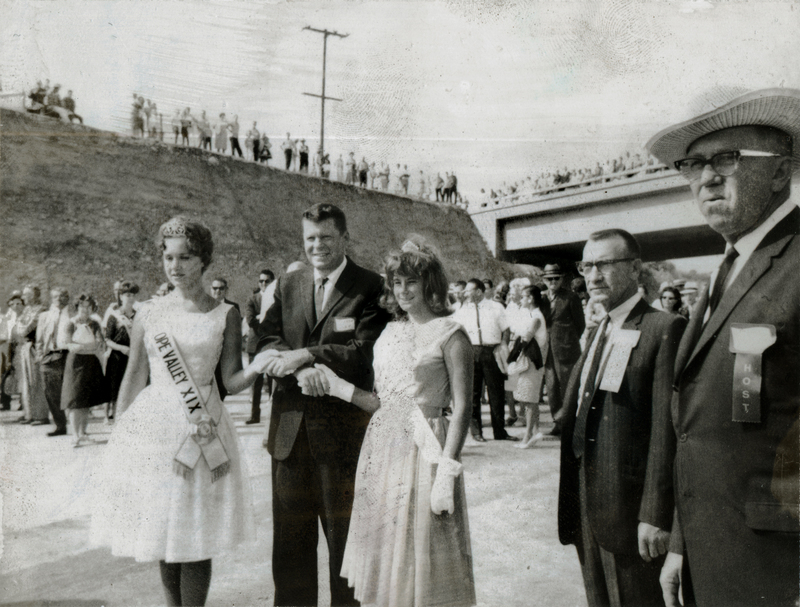 August 23, 1963 — Spectators line the Sand Canyon overpass and beauty queens flank Los Angeles County 5th District Supervisor Warren Dorn at the dedication ceremony for the first section of the Antelope Valley Freeway, which stretched from (east of) Solemint Junction in Canyon Country to Red Rover Mine Road in Acton, where the ceremony ended with political speeches. The freeway opened to traffic in October. The young lady at left is Rhonda Cox of California City, Miss Antelope Valley for 1963. Her court is at far left. To the viewer's right of Dorn is 15-year-old Bonnie Dillenbeck (later Jones). Born in December 1947, she's the third of six children of Charlie and Gertrude (Powell) Dillenbeck, owners of Dillenbeck Canyon Market on Sierra Highway. Bonnie was Miss Tri-Canyon for 1963, the three canyons being Mint, Sand and Soledad. Second from right (next to Bonnie) is Frank Collins, Charlie Dillenbeck's politically connected partner in the store. The Antelope Valley Freeway was built in sections from 1963 to 1975 as an upgraded bypass to old U.S. Highway 6 between Interstate 5 (initially US-99) at the Newhall Pass on the south and US-395 at Inyokern on the north. Locally, US-6 was known as Sierra Highway. The first freeway section, from a point east of Solemint Junction (Soledad and Sierra) in present-day Canyon Country to Red Rover Mine Road in Acton, opened Aug. 23, 1963. Additional sections extended the freeway to the Soledad Pass (Vincent Grade south of Palmdale) in 1965, to Avenue P-8 in 1966, and to Mojave in 1972. The section from Mojave to Inyokern is called Aerospace Highway. As of 1964, Sierra Highway lost its designation as US-6 and became State Route 14 — except from Solemint to Red Rover, where the new SR-14 freeway alignment had already been completed. After that, the SR-14 designation was transferred from Sierra Highway to the new freeway as each new section was completed. Other parts of old US-6 south of Bishop became US-395, I-5, I-110 and SR-1 at Long Beach. Within the city of Santa Clarita, one stretch of Sierra Highway was never fully decomissioned. As a result, Caltrans maintains the section of Sierra Highway from 500 feet north of Newhall Avenue to Whispering Leaves Drive, and it is the California Highway Patrol's responsibility to enforce traffic laws there. 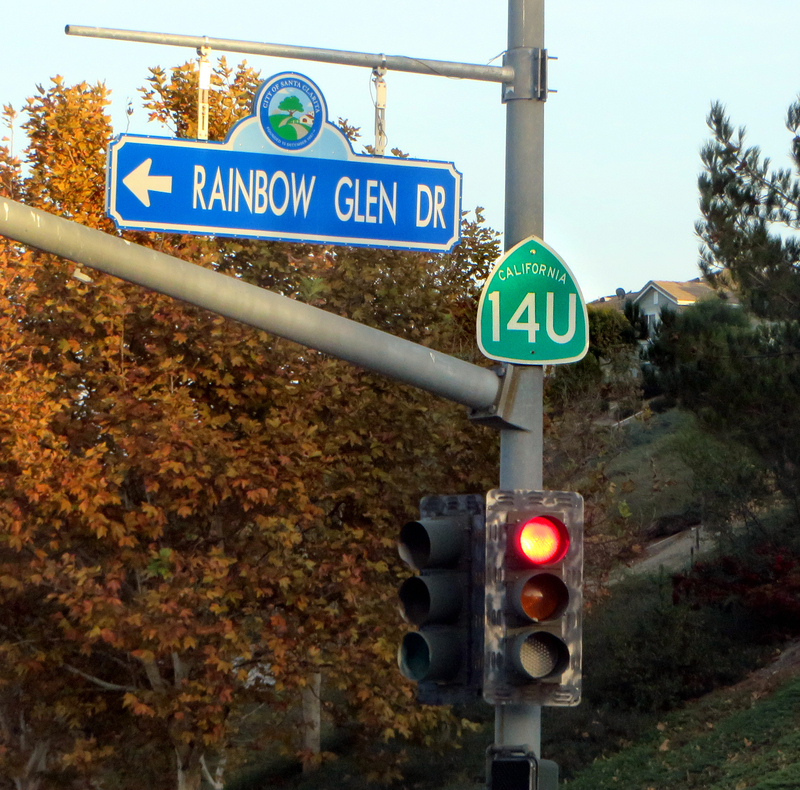 This section bears the unusual designation of SR-14U, where "U" stands for "unrelinquished." The rest of Sierra Highway that's inside the city is a city street. UPDATE: In 2017, the state Legislature approved AB 1172 (Acosta-Wilk), which clears the way for the relinguishment of SR-14U between Newhall Avenue and Friendly Valley Parkway upon a future agreement between the city and Department of Transportation, without requiring further legislative action. DB6301b: 19200 dpi jpeg from original print.